I tend to lump almost all singles into the two-star category because they're chiefly for collectors and fans, and in some cases, just the completionists. 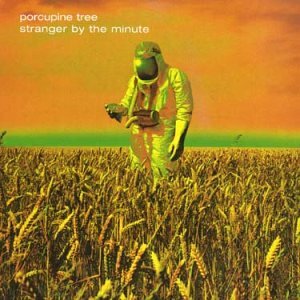 Here we have the single for Stranger by the Minute, of which the original song was from Porcupine Tree's Stupid Dream album. This is an edited version of the song, designed primarily to fit into the scope of radio play. If it's under four minutes, radio stations tend to like it. Besides, it gives them more time for advertising. There isn't anything particularly special about this version. Some of it is missing. The longer, original version is much more preferable. Why not just get the Stupid Dream album instead? The second song on this single is the second part of Even Less, which did not make it onto the Stupid Dream album. Die-hard fans were probably interested in acquiring this just to hear this song. If they had waited two more years for the release of Recordings in 2001, they would not only have part two of this song, but the entire song (both parts) in one piece. Finally, a music video of Piano Lessons is included. It's a nice music video, a bit strange as expected, but nothing really worthwhile for seeking this out. If it hasn't already, it will some day end up on a DVD. It's already on YouTube. Primarily for collectors, fans, and completionists like so many other singles are.